All the best parts of FOX’s “So You Think You Can Dance” return for season 15. The judges, the host Cat Deeley, and of course, fresh young talent! The first round of auditions took place in Los Angeles, California. 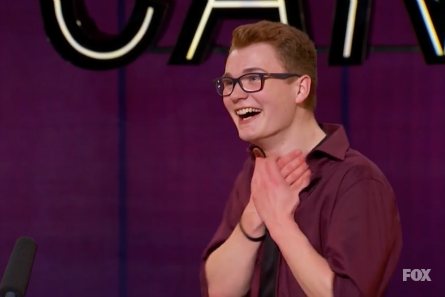 The premiere episode showcased a slew of dancers in all genres to show what they’ve got at their call-backs auditions hoping to get their hands on a Golden Ticket taking them into the next round – The Academy. Judge and executive producer Nigel Lythgoe stated that there’s no choreography round. 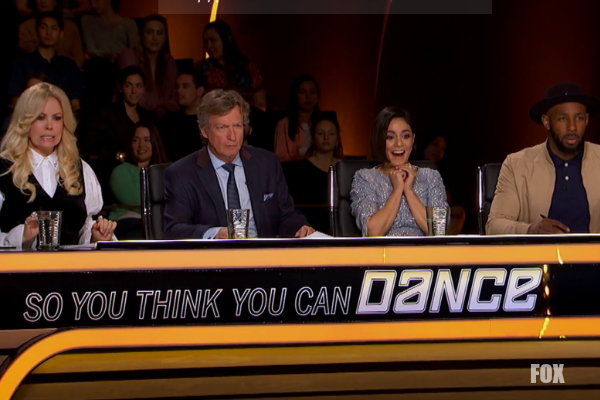 “If these kids are good, they’ll go straight to The Academy round.” The returning judges are Nigel Lythgoe, Vanessa Hudgens, and Mary Murphy. Joining the judges’ panel for this leg of the show was SYTYCD All-Star and former contestant, Twitch. Twitch said it’s full circle for him because ten years ago he auditioned for SYTYCD in Los Angeles. Pictured: Marina Mazepa auditions for SYTYCD season 15. Marina was the first contestant up to dance in front of the judges at the Los Angeles auditions. She came out in a freakishly, and odd dark looking outfit with her hair covering her face in a “Ring” style way. Then as she performed, everyone could see the art in her routine that was an interpretation of rebirth. Nigel responded, “I can’t say I’ve ever seen anything like that…like the birth of a dancer.” Marina agreed. Vanessa called it “profound” and she was in awe. Twitch said it was a “hot way to open the morning.” He added that for themm to see something that they’ve never seen before is something truly special. She got a ticket to The Academy. Next up was an 18-year-old B-Boy named Gaevin from Las Vegas. He calls himself “G-Rated.” He’s a B-Boy teacher and performs on the Las Vegas strip. Vanessa reacted to his audition “you’re strong. Twitch told Gaevin that the cofidence he brings as a B-Boy is “second to none” and wanted to see him “package those moves.” Mary felt he held back a little bit. But, had some tough tricks. Nigel told Gaevin that he’s one of the best B-Boys he’s seen. But, he was concerned that he wouldn’t be good at the Viennese Waltz. Gaevin got a ticket to The Academy. After their audition, the judges reactions seemed unanimous. Mary said Allen has improved, and she loved every second of their audition. Marcus was strong, but over-shadowed by Allen. She called Magda “the IT girl” and one of the hottest Hot Tamales they’ve had! Nigel said Marcus was a little bit too quiete for him. Vanessa said Allen had her eyes the entire time. Twitch called Allen a star. Other ballroom dancers who got tickets with their partners to The Academy included: Cole Mills & Natella Devitskay; Tristen Sosa & Stephanie Sosa; Dillon Lehman (solo); and KJ Mills & Hope Jackson. Twenty-year-old Taylor came the furtherest for the audition from Anchorage, Alaska. Her mom is was an Olympic Nordic skier. Taylor’s foot was amputated at eleven months old due to a birth defect. But, it hasn’t held her back from dancing. Unfortuantely, none of the judges thought she was physically strong enough to compete in “So You Think You Can Dance.” Taylor wasn’t too sad about it because she was so thrilled to have auditioned to the judges she has looked-up to since a young age. Pictured: Jay Jackson, SYTYCD audition. Jay is twenty-nine-years old from Dallas, Texas. He started doing drag after he found it difficult to find work as a “feminine” male dancer after graduation. He said “drag chose me. I didn’t choose drag.” During his audition, Nigel kept covering his face. He said Jay made his eyes water three times during his audition and listed them. One was when Jay did the jumping splits! He wasn’t sure about Jay going to The Academy. Vanessa called Jay and “amazing spirit with so much passion.” Twitch said Jay has strength and courage. But, his jazz wasn’t that strong compared to other dancers. Mary wanted to see Jay come back “with more tools.” However, Mary ended-up having the tie-breaking vote on whether or not Jay would go to The Academy. Mary ultimately said “it’s crazy” and she’s crazy. So, she said “yes” to Jay! Alexis is twenty-three years old from Riverside, Ca. Viewers will remember Alexis from last season when she was placed on Jenna’s Team. However, she got cut after the Group Choreography round. Alexis said she got so much positive support from viewers and fans of the show, that she decided to come back. Alexis also trained like crazy in all dance genres and wanted to prove that she’s worked hard enough to be there and go on in the competition. Ater Alexis’ audition, Twitch said she came back strong and is fantastic. Mary reacted that Alexis “knocked it out of the ball park!” Nigel was impressed, “when God created the human body, I don’t even think he knew what was going to be one with it.” Vanessa said Alexis “shined like a star.” She got the ticket to The Academy. Twitch commented that “you can either come back the same, or come back stronger.” Nigel told Twitch that he came back strong after he returned to SYTYCD. Nigel gave him a standing ovation. “There were so many good things in there. I thought it was wonderful to watch,” said Nigel. He also added that he loved the rhythm. Nigel gave a high compliment to Eddie when he called him a great asset to the world of tap. Vanessa said “you make me so happy. Just seeing your joy right now.” Twitch told Eddie that it was a joy to watch, and wish he could be as good as that. Eddie said he wished he could do Hip-Hop as good as Twitch. Hence, a dance-off happened between the two. Twitch joined Eddie on stage and the each performed their style of dance.